As part of my plan to walk the South Downs Way in 2017, last week we headed up the road to Pyecombe. The weather is improving, so long walks seem much more appealing, however it is tricky finding time to get out and about. We both work six-day weeks, and Sunday is usually taken up with football. However, we had a week off from standing on the touchline and so headed 10 minutes (on a good day) up the road. I found the walk on the Sussex Living website. As I tend to not have time for a full days walking I have been researching shorter, 1 to 2 hour circular walks along the SDW, and finding there is a lack of them. As soon as you type South Downs Way into Google it comes up with mammoth walks, and little for what I would call the 'hobbyist' like myself. Anyway, this walk starts in the village of Pyecombe and was described as short, but hilly. However, we quickly discovered these hills are what give walkers brilliant views. We found it tricky to find the start of the walk as the gate had a 'knack' to it, and we started to wonder if we were going the right way. As we were milling about an experienced walker strode up the lane, sensible shoes, backpack and a wooden stave in hand, and jumped up the bank next to it and walked round. So we followed her and started the walk. It was quite a blessing she was in front as there were lots of livestock around. Firstly some sheep jumped across the path in front of us, heading to another field. Then as we looked across the field we spotted a goat among the cows looking rather majestic. As we walked further up the path there were cows everywhere. I am not used to this and all I could think of was tales of dog walkers being trampled by cows. We managed to get safely through, although I did think about just walking home so I didn't have to pass them again. I read through the walk and we returned a different way - thank goodness! As we walked up the hill we started to get a glimpse of the amazing view looking north. However, the best views were to come. At the top of the hill we passed a dew pond, then went through a gate and on to Newtimber Hill. As we walked along the top of the hill the views were just, well, out of this world. 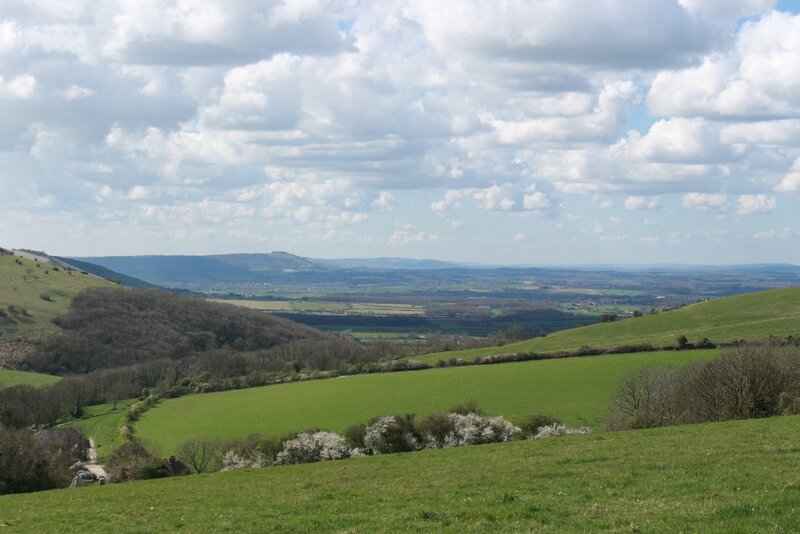 I have been up to Devils Dyke many many times since I was a child yet I would say the views from here were better. I think the fluffy clouds helped. It was also good to get a different viewpoint, it is so easy to go up the Dyke as we know it, but this walk meant we got a completely different view. This is far cheaper than the I360, and the view just as good! At the top of the hill we went through the gate and started our descent, through a field of sheep as fluffy as the clouds. I fell in love with the tree below right. My husband tried to go all QI by telling me weathered trees like this have a name, but then couldn't remember what it was. On the way down there was also a lovely view of the Jack and Jill windmills on the opposite hill.